Highly computerized investigation story, that changes direction as quick as it can in digital age. I highly recommend this movie. The actors, script and story line was right on. It kept me at the end of my chair. I will say no more. I don't want to give it away. This movie was quite a thriller, intense, turns and twists. A must see for parents today, all about a missing teen and facebook/internet/messaging. Intelligently done, riveting. Great cast and acting. I would go again! Decent original premise about a missing person. Told early on mainly through text messaging and video chat. Very well put together. Initially. The weak self conscious acting of the cop lady kind of lets the cat out of the bag, which is too bad. The father is great though in a tough acting assignment. One of the better movies I've ever seen. With lots of twists. Highly recommend. A number of "red herrings" constantly throw you off the trail of this good mystery story. Real story of movie is how easy it is to lose track of what is happening with your children even when a great deal of love is present in the family. I enjoyed the movie quite a bit. Great movie, very original and with some excellent plot twists. Superbly acted as well. These one-star ratings sound like plants...fake reviews. When everyone is giving the movie 4 & 5 stars these jokers give it one. Think,about it. This suspense movie keep you guessing until the end. I really enjoyed it. I agree that most of the dialogue is through the computer, through messages , Skype and video clips but still keep you in suspense throughout the development of the story. What really happened to the promising student? Who did such an atrocious crime? Not who you thought all along!!!! The format was really annoying - watching a computer screen, instead of a movie. A must see movie for all ages! Loved every second of this movie! Great movie, alot of twist and turns. Keeps you wondering. This was a great thriller with numerous twists. Excellent whodunnit, filmed as if you are seeing things from the father’s point of view through the computer screen. It had a real Indie feel, only recognized the father (John Cho) who is not always likeable as he starts to fall apart as the movie progresses. Some good moments highlighting the devolving state of social media adds to the back story and sends the father even further over the edge. This is the best who-done-it I’ve seen in ages. Had me sitting on the edge of my seat. Lots of twists and turns. I didn’t guess the final outcome until near the end. And it’s use of modern media to tell the story is brilliant. Can’t say enough about this movie. Except, go,see,it. 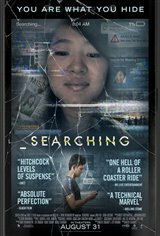 "Searching" is a creative and riveting film which artfully uses the internet, Skype, tumbler, Facebook and many forms of social media to tell the story. This is a very original and exceptional film technique. Jame Cho's and Debra Messing's perfromances are excellent! Go see this one! Suspense from start to finish with a twist at the end. Love it. Excellent movie, great twist at he end. Didn’t see it coming.